09:24 Stompro Good morning all, can anyone point me to documentation on setting up a multi brick install? Or answer some general questions about it? Does each brick run everything that a stand alone system runs except for the DB? So each brick runs ejabberd stand alone so to speak? 09:25 tsbere I will note that the ejabberd instances need to be able to communicate with one another if you are load balancing between bricks. 09:26 tsbere Stompro / csharp: Also, don't you need a common memcache normally? 09:26 Stompro Err, that would be a no. 09:27 tsbere Stompro: I think you will want thinks like private.brick1/public.brick1, private.brick2/public.brick2, etc so they can be set up to communicate with one another. 09:29 tsbere Stompro: I suppose each brick needs potential access to shared storage for things like reporter output, uploading offline circs, etc. I have never set up a "multi-brick" setup so I am not 100% sure what is needed there. 09:29 tsbere csharp: Why can't a single server be a "brick"? 09:30 Dyrcona Well, if you think about, a single server would be a brick, if you look at "brick" as an atomic unit of build materials. 09:30 Dyrcona A cluster of bricks would be well, bricks. 09:31 Dyrcona But maybe that's just from doing masonry and carpentry work as a teanager/young adult. 09:32 csharp that's all academic though - we still name our servers "brick01-head", etc. 09:33 Dyrcona Or bh1 and bh2 as I've seen at one site. 09:37 Dyrcona Speaking of building VMs.... I'm going to build two today to test csharp's changes for Safe.pm. 09:37 Stompro Thanks for the info all. 09:38 Dyrcona Yeah, we're buying 5 machines next week and we're considering a couple of different configurations. 09:40 Dyrcona 's the term they use). 09:50 mmorgan Quick web client question anyone? Do I need to be registered to a workstation to login? 09:51 mmorgan Screen is just refreshing at the login page. Maybe I'm doing something wrong. 09:51 kmlussier mmorgan: You can log in without a workstation, but last I saw there were some bugs that appeared if you did not register a workstation. 09:51 kmlussier mmorgan: What browser are you in? 09:52 * kmlussier wishes there was a way to require workstation registration in the web client. 09:53 * mmorgan does too, but right now, I'd love to login. Different computer that hasn't logged into it before. 09:54 kmlussier And I guess you can't register the workstation if you can't log in. 09:54 * kmlussier doesn't like that bit either. 09:54 Dyrcona Well, that's the same as the current staff client. 09:54 Dyrcona Your workstation is registered "locally" and in the database. 09:55 Dyrcona Can't register it in the database if you can't login. 09:55 * csharp makes the excuse to his demo-ees that the server is "constantly under development"
09:55 mmorgan Oh! https!! Working now! 09:55 * mmorgan runs off to meeting. 09:56 kmlussier Ah, https. That one gets us all the time. 09:57 kmlussier Dyrcona: I should restate that. It isn't so much that you have to log in. It's that there isn't a quick option to register the workstation right from the login screen. 09:58 kmlussier It just adds a few steps to the workstation registration process. Especially in those places where the login that registers the workstation isn't the same login that will be using the workstation. 09:58 Dyrcona Well, the current staff client gives you the illusion that it is done in one step, but it really isn't. 09:59 Dyrcona Anyway, I get what you're saying, and it might be nice to have it right there. 11:05 yboston bshum: got a moment? 11:06 bshum yboston: What's up? 11:07 yboston Good morining. In a month ESI is upgrading me to 2.7, is there plans for a new point release for 2.7 anytime soon? 11:08 bshum But I'll admit, I was on a plane and indisposed to cutting anything. 11:08 bshum I'm still kind of away at the moment. 11:09 Dyrcona "Kind of away?" 11:10 Dyrcona bshum: What time is it in Hong Kong? 11:10 yboston what year is it? 11:10 bshum And copy/move the commits from rel_2_7 to whatever future based branches you need. 11:10 bshum It's still 2015 over here. 11:10 bshum It's a twelve hour time difference. 11:10 bshum So it's 11:10 pm, Thursday April 16. 11:11 * kmlussier wonders if an Evergreen release has ever been cut from Hong Kong before. 11:11 bshum I'm in your future. 11:13 pinesol_green csharp: 1 found: #44: "<bshum> Hmm, maybe it's just me, but your..."
11:13 * bshum cracks open a fortune cookie, "Do not mistake temptation for opportunity"
11:14 pinesol_green collum: The current temperature in Hong Kong Inter-National Airport, Hong Kong is 71.6°F (11:00 PM HKT on April 16, 2015). Conditions: Scattered Clouds. Humidity: 65%. Dew Point: 62.6°F. Pressure: 29.94 in 1014 hPa (Rising). 11:15 collum Just wondering about the temperature. 11:15 bshum It is warm. 11:18 bshum kmlussier: I don't think I've ever cut a release while overseas. But I know I've pushed git commits before. 11:26 csharp game idea: find the commits bshum pushed from overseas... GO! 11:27 Dyrcona csharp: Your changes for Safe.pm work for me on Ubuntu 12.04 and 14.04. Events still seem to work. 11:27 Dyrcona Do you think someone else should look at the branch on Debian and/or Fedora before it is pushed to master? 11:29 Dyrcona Ok. I'll comment on the bug to that effect. 11:34 bshum yboston: On a more practical note, I was thinking to cut 2.7.5 later next week; give folks some time to test and push on more bug fixes. 11:35 bshum Personally, I'm poking at more stuff for 2.8.1 though. Now that Bibliomation is on 2.8 and all. 11:35 bshum And eating food. 11:36 bshum I mean literally, every time I'm in Hong Kong, it's "hey long time no see" and "you hungry? Eat this..."
11:36 kmlussier bshum: You're eating food at 11:30 PM? 11:37 bshum No, I just got back from eating "dinner"
11:37 bshum Though I'm sure there's snacks or something somewhere just waiting for me. 11:48 kmlussier Bmagic: Just a thought on your two Long Overdue bugs. bug 1440148 looks like a bug fix, meaning it could potentially be in a release soon. 11:49 kmlussier And bug 1331174 looks like a new feature and won't be in a release until September at the earliest. 11:49 kmlussier So I would think we would want to sign off on the code in the first bug and get it into master. 11:49 kmlussier And then the code from the second bug would then build off of that code. 11:50 kmlussier Bmagic: I can take a look at the first one somtime if nobody else gets to it. But I'm a bit low on tuits this week. 11:50 Bmagic The new feature, you mean, would need to be rebased on those bug fixes after they are commited? 11:52 kmlussier Bmagic: Yeah, I guess that's what I mean. I just wasn't sure if that last comment meant you were incorporating the bug fix into that branch. 11:52 Dyrcona yeah, I'm not sure what that last comment means. 11:52 * kmlussier needs to disappear for lunch. 11:53 Dyrcona I took it to mean they were incompatible. 11:53 Bmagic You can use one or the other, but not both. So if the bug fix is commited, then the code for the new feature would need to reverse that commit with it's commit. If that makes sense? 12:02 jonadab Rebasing on that commit will give you a chance to resolve that conflict in favor of reverting the unwanted change or whatever, then git rebase --continue and Robert becomes avuncular. 12:07 jeffdavis The fix for bug 1074096 was missing a piece. I have a working branch with the missing bit. 12:08 jeffdavis The bug is marked Fix Released. I'm thinking I should change that to Triaged and retarget it at the 2.8.1 milestone, would that be the best approach in this situation? 12:10 bshum jonadab: "Robert becomes avuncular"... Hmm, "Bob's your uncle"? 12:10 * bshum wonders the origin of that saying now. 12:11 bshum jeffdavis: That's one way. Another is to file a new bug to complete it and reference the original. 12:11 dbs Robert may become avuncular, but will Dojo become Angular? 12:11 Dyrcona Avuncular often has a slightly negative connotation, as if to imply patronizing tone. 12:12 csharp @quote add < dbs> Robert may become avuncular, but will Dojo become Angular? 12:12 pinesol_green csharp: The operation succeeded. Quote #113 added. 12:12 csharp @who is the quote librarian? 12:12 pinesol_green phasefx_ is the quote librarian. 12:14 pinesol_green chatley becomes Electra. 12:25 Dyrcona S'pose we could a googlefight plugin to pinesol_green. 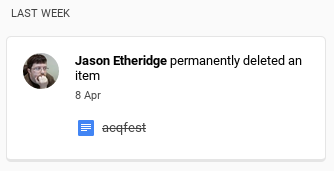 13:13 dbs phasefx: you permanently deleted the old "acqfest" google doc? Oh no, one part of our history is forever gone! 13:22 phasefx interesting. Can you tell if it's my personal account or esi? 13:30 kmlussier Heh, the date on the oldest file is the day I started at MassLNC. 13:59 krvmga eeevil: we're upgrading to 2.7 over the weekend and we're really worried about the slowness of the All Books search. 13:59 krvmga if we have to, can we disable that format limiter? 13:59 csharp krvmga: you've seen bug 1438136, yes? 14:01 kmlussier krvmga: Is it just the All Books limiter or others as well? 14:01 krvmga gmcharlt: are you aware of this for our upgrade? 14:01 * kmlussier quickly finishes her CoC report for the EOB. 14:02 pinesol_green Meeting started Thu Apr 16 14:02:35 2015 US/Eastern. The chair is bbqben. Information about MeetBot at http://wiki.debian.org/MeetBot. 14:02 pinesol_green Useful Commands: #action #agreed #help #info #idea #link #topic. 14:06 buzzy attendance is low, unfortunately. 112 people. nonetheless, we're hoping for a great conference. 14:08 kmlussier buzzy: I have a question about the budget you sent out earlier. 14:08 buzzy i did want to ask you guys when you'd like to have your eob meeting. we've got some rooms set aside, but if there's a particular day/time that you have the conference meeting, i'll make sure that we set it aside for you. 14:08 kmlussier The food totals there, do they reflect the food & beverage minimum? 14:09 buzzy no, those are the numbers that we have based on attendance. because attendance is lower than budgeted, we'll be discussing the issue with the venue. 14:10 kmlussier Given that we're so close to conference time, I would like to see a worst-case scenario budget. Basically, if the venue doesn't budge on the minimum, how bad does it look? 14:10 buzzy assuming no further sponsorships? 14:11 kmlussier Also, it appears as if the budget doesn't account for all of the signed sponsorship agreements we have. 14:11 kmlussier buzzy: Yes, assuming no further sponsorships. I don't think we need to see it now if you don't have it ready, but I think it would be good to see all the numbers as they stand now. 14:12 buzzy okay. to which sponsorships are you referring? 14:13 kmlussier It looks like you just have one $4,000 Platinum sponsorship there. But I could be reading it wrong. 14:13 buzzy i will try to send out a worst case scenario budget by monday, if that's all right. 14:14 bbqben any other q's for buzzy? 14:16 montgoc1 On the site, the Shuttle Options still say in progress by the link. 14:16 buzzy ah, you're correct, kathy. thank you! 14:16 montgoc1 Can that get removed? 14:18 bbqben any discussion of finances? 14:21 bbqben any discussion or just feelings of warmth towards the devs? 14:24 bbqben any volunteers for the noms comm? 14:24 kmlussier Did we do this last month? 14:25 montgoc1 Yes, we did discuss it at the last meeting. 14:25 bbqben kmlussier no worries. 14:26 bbqben anyone else (optional)? 14:26 bbqben wow - kewl - show me? 14:28 bbqben anyone test the voter reg survey? 14:28 kmlussier I looked at it. Didn't submit, though. It looked good to me. 14:29 csharp it just asked for my name, org, and whether I was legit - is that all it's supposed to do? 14:32 kmlussier The committee isn't official, but the members already had the name discussion. So we've revised the proposal to call it Outreach, rather than Public Relations. 14:32 kmlussier I think we need a vote to formally accept the proposal. Sorry, I wasn't thinking of that last time around. 14:33 kmlussier The EOB is also charged with appointing members, so I think we need a vote to appoint RoganH, graced, Amy Terlaga, Ron Gagnon and me to the committee. 14:33 kmlussier That is, if you're ok with us serving on the committee. 14:33 kmlussier I think that's it. 14:33 bbqben kmlussier - thanks. Any discussion before we call these votes? 14:34 kmlussier Almost forgot. Our first real conference call is tomorrow. I'll be posting updates as we go along. 14:35 pinesol_green Begin voting on: Does the EOB formally accept the Outreach Proposal as submitted? Valid vote options are Yes, No, Abstain. 14:35 pinesol_green Vote using '#vote OPTION'. Only your last vote counts. 14:37 pinesol_green Begin voting on: Does the EOB appoint RoganH graced Amy Terlaga Ron Gagnon kmlussier to the Outreach committee? Valid vote options are Yes, No, Abstain. 14:37 pinesol_green Vote using '#vote OPTION'. Only your last vote counts. 14:42 kmlussier I was hoping to have these somewhat finalized by today, but I think they still need a little work. 14:43 kmlussier We've made a lot of progress on this. I think the big discussion Valerie Aurora wanted us to have was to ensure that the Safety Committee is empowered to make decisions when it comes to people in leadership positions. 14:43 kmlussier We've had that discussion among ourselves (ourselves being Safety Commitee and incident responders), but I just want to put it out there for the EOB to see if there were any thoughts on it. 14:44 kmlussier I think gmcharlt had an excellent idea of having people in leadership roles actually signing off on the CoC and agreeing to sanctions handed down by the Safety Committee. Appeals can be made to the EOB. 14:44 kmlussier So that's the direction we're heading. 14:46 kmlussier I want to polish it a bit more. At some point, either today or via email, I think we need to appoint the Safety Committee reps.
14:47 kmlussier I also would like you all to consider my recommendation that we donate $200 to the Ada Initiative as a thank you for reviewing our procedures and meeting with the people who volunteered to be incident responders. 14:47 kmlussier The Ada Initiative has done a lot of great work getting conferences to create and implement Codes of Conduct and depends on donations to keep their operations going. 14:49 yboston My only concern is making sure enough people have copies of these procedures handy during the cnference. I don't expect it would be hard to have copies of the procedures handy in the "registration area"
14:49 kmlussier yboston: They will be in the printed program. 14:49 kmlussier I'm also planning to write a blog post ahead of time. I think we also have some time to talk about them during the Thursday morning session, before the keynote. 14:50 kmlussier I'll need to re-confirm that, though. 14:50 kmlussier I basically want everyone to see the faces of the incident responders. 14:50 kmlussier Given the time, I think we can hold off on appointing Safety Committee members and do it via email. But would we be able to vote on the donation today? 14:51 bbqben any discussion about the donation before we call a vote? 14:53 bbqben #startvote donate $200 to the Ada Initiative as a thank you for reviewing our procedures and meeting with the people who volunteered to be incident responders. 14:53 pinesol_green Unable to parse vote topic and options. 14:54 kmlussier I'm not aware of any. 14:54 kmlussier Sorry, I lost my Internet connectin for a minute there. 14:54 pinesol_green Begin voting on: Does the EOB donate 200 dollars to the Ada Initiative as a thank you for reviewing our procedures and meeting with the people who volunteered to be incident responders? Valid vote options are Yes, No, Abstain. 14:54 pinesol_green Vote using '#vote OPTION'. Only your last vote counts. 14:56 graced We have two great proposals that the site selection committee reviewed. 14:57 graced We are ready to make a recommendation but would like to move it to a private discussion with the EOB if that is agreeable. 14:57 kmlussier I'm fine with that. 14:58 graced I'm afraid I will have to ask montgoc1 to recuse himself from that discussion though since he's a proposal submitter. 14:59 graced IF that is agreeable, I will follow up with an email. 14:59 graced Questions or concerns? 15:00 bbqben anyhoo - great to see interest in EG2016 - exciting stuff! 15:02 graced I'd like to propose that the EOB consider budgeting for (and paying for) the new lanyards in bulk and not on a per conference basis. Since these lanyards tie into the photography policy and will be used for many years to come it makes sense to me to budget for it and buy in bulk. 15:03 graced There isn't really a vendor sponsorship opportunity attached to it any more, so it's a known recurring expense which, to me, makes it unique. And it will be one less thing for local committees to deal with. 15:03 bbqben graced - quantos deniros? 15:03 graced kmlussier: what were the final numbers? 15:03 abneiman I imagine it's probably far cheaper to buy in bulk, yeah? 15:04 kmlussier It's $1,250 to purchase 500 green, 250 yellow, 250 red. 15:04 kmlussier As a reminder, green means it's okay to take a photo, yellow means a person must ask first, and 250 means no photos. 15:04 bbqben graced 3750 all-in? 15:04 kmlussier With the red and yellow, we're not really seeing a savings because we're getting the minimum. There is a savings with the green. 15:05 kmlussier I expect most people will choose green. 15:05 kmlussier We were thinking they could also be used for other Evergreen events, like the hack-a-way. 15:06 graced I will happily volunteer Equinox to ship the lanyards to each conference site and store them between conferences. 15:06 bbqben seems like a no-brainer. Shall we call a vote? 15:08 pinesol_green Begin voting on: Does the EOB support buying lanyards in bulk re: Photography policy per the raw log minutes of this meeting? Valid vote options are Yes, No, Abstain. 15:08 pinesol_green Vote using '#vote OPTION'. Only your last vote counts. 15:09 bbqben any other new business? 15:09 kmlussier Then we need to do more votes! 15:10 bbqben any other new business? 15:11 bbqben #topic Next meeting: 14.05.15 @ 1900 Pacific - in person during conference. 15:11 bbqben anyone from the EOB not planning to attend the conference? 15:11 bbqben more specifically - will anyone need to dial or skype in? 15:12 kmlussier I'll be there. 15:12 bbqben ok, cool, see y'all soon. 15:13 pinesol_green kmlussier: Karma for "y'all" has been increased 7 times and decreased 0 times for a total karma of 7. 15:14 kmlussier krvmga: Are you still around? 15:14 kmlussier krvmga: Did you get an answer to your earlier question regarding the All Books filter? 15:15 pinesol_green csharp: Karma for "all y'all" has been increased 2 times and decreased 0 times for a total karma of 2. 15:15 kmlussier As far as removing the filter, I think it's a matter of going into your Coded Value Maps and removing All Books for the OPAC format group. 15:16 pinesol_green bbqben: moving on has neutral karma. 15:16 kmlussier krvmga: Oh, ok. I thought that was your original question. 15:16 pinesol_green Dyrcona: It's all office wifi's fault! 15:16 krvmga kmlussier: no, i just don't want the searches to be slow. 15:18 krvmga i even get scowls from central site staff sometimes as though i'm truly the god of the opac and can do anything mwahahahahaha! 15:47 Dyrcona Though krvmga has left, I have loaded the branch in question on my development server and searches with formats don't seem slower than those without. 15:48 Dyrcona IOW, it appears to have helped things. 15:56 kmlussier If I had looked at the Ada Initiative site before the EOB meeting, I would have recommended a donation of $256 instead of $200. 15:57 Dyrcona Donald Knuth used to pay that much for anyone who found "bugs" in his books, or maybe it was $2.56. 15:57 Dyrcona No one every cashes the checks, they frame them. 15:58 * Dyrcona hangs his head in shame. 15:58 kmlussier If it were $256, I would actively hunt down the bugs in his books. 15:58 kmlussier Dyrcona: Will you pay me $256 if I find "bugs" in your IRC posts? 16:00 Dyrcona It was bugs in tex, actually. I'm buggy today. 16:09 Dyrcona And, it started at $2.56, 1 hexadecimal dollar. 16:43 kmlussier Is anyone from ESI still around who could answer a question regarding shipping something to your office? 16:44 kmlussier eeevil: Are you worried? 16:44 kmlussier eeevil: I just need to know what your shipping address is if UPS is used. Looks like you typically use a PO Box? 17:36 eeevil @later tell Dyrcona belated thanks for testing the search branch, though think your dataset may not need it? 17:36 pinesol_green eeevil: The operation succeeded. 18:54 kmlussier gmcharlt: Is that policy really still a draft? I thought we had voted on it.